"June is busting out all over"....the shelters are full to the rafters and are busting at the seams with kittens and cats!! According to the ASPCA June is Adopt-A-Shelter-Cat Month. We agree that that should be the theme every month, but since every Spring an enormous number of kittens are born, we think it is great to raise awareness to please, please adopt a shelter cat! You will never regret that decision, your heart and your home will be over flowing with furry love, that is the BEST gift that you could give to yourself and others. 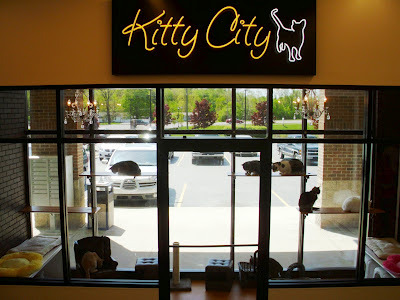 I want to remind the folks in Michigan that Kitty City II is having their GRAND OPENING starting at 4 p.m. on Friday, June 1 through 5 p.m. on Sunday, June 3. Adoption fee of $59 includes spay or neuter, vaccines and health check. All cats are from Oakland Pet Adoption Center in Auburn Hills or Elizabeth Lake Animal Rescue in Waterford. Kitty City II is identical to the original Kitty City at Pet Supplies Plus in Bloomfield Hills. Both are free- roaming, cage free adoption centers, designed by Addy Shattuck, that enable kitties waiting for new homes to watch the birds outside through floor-to-ceiling windows, lounge in miniature arm chairs, and enjoy the soft breeze of an overhead ceiling fan. Shattuck designed each Kitty City with plenty of perches for cats to climb, soft beds for sleeping and concealed litter boxes for privacy. At any given time, each Kitty City is a temporary home to 20 or more cats. On Sunday, June 3 customers can bring their cats and dogs to a pet health care fair from 8 a.m. to 4 p.m. that includes free wellness exams and reduced cost vaccines, feline leukemia tests and microchipping provided by Union Lake Veterinary Hospital. They will also be treated to a free barbecue lunch from noon to 3 p.m.
As a special treat I will be volunteering Sunday, June 3rd starting at 11am and there is a super great rumor that Pam from Pet Blogs United will be joining me! How great will that be? I get to FINALLY meet her in pawson!! I was telling Pam that with both of us living in Michigan it is pitiful that we have to cross the country to meet at BlogPaws! Heck, we live 30 minutes apart for Pete's sake! I am hoping she is there Sunday because it will be great to meet her! So, if you are in the SE Michigan area, stop by and enjoy the GRAND OPENING of Kitty City II, come and meet Pam and I, bring some friends and help to give these deserving babies their furever homes!! Pet Supplies Plus in White Lake Twp. For information, call 248-889-4131 or go to www.petsuppliesplus.com. I hope the event goes well and lots of kitties find new homes. There are lots of sweet, adorable shelter cats out there just waiting for the right person to take them home. Dear Caren and Cody and Dakota, me is so far behinds in visiting everybody! Kozmo hided my iPad so me would not knows about my pawty! And what a pawty is was! This is a great post about adoption, Me thinks peoples should. After all, me was adopted from a shelter. Purring for all the kitties that they find their perfect forever home! Kitty City does look very well designed. We do have a question though, do the cats ever fight since it is a cage free facility? We do hope many of the cats get to go to their forever homes. I think all schools should have a field trip to Kitty City! Hoping for lots of new homes for fur friends this month! It sounds like a fantastic event and I hope many cats can find their homes soon! And you're doing a great job too, Caren! 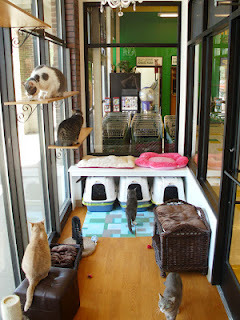 The Kitty City looks a wonderful place for kitties waiting for their furever home. We hope there are lots of adoptions and happy homes. Hi and we really wish you good luck with adopt a cat month. Are paws are crossed. That sure looks like a wonderful place. Wish we had something like that around here. Hope that event is a huge success and lots of kitties find homes.Thanks for all this great info.Take care. 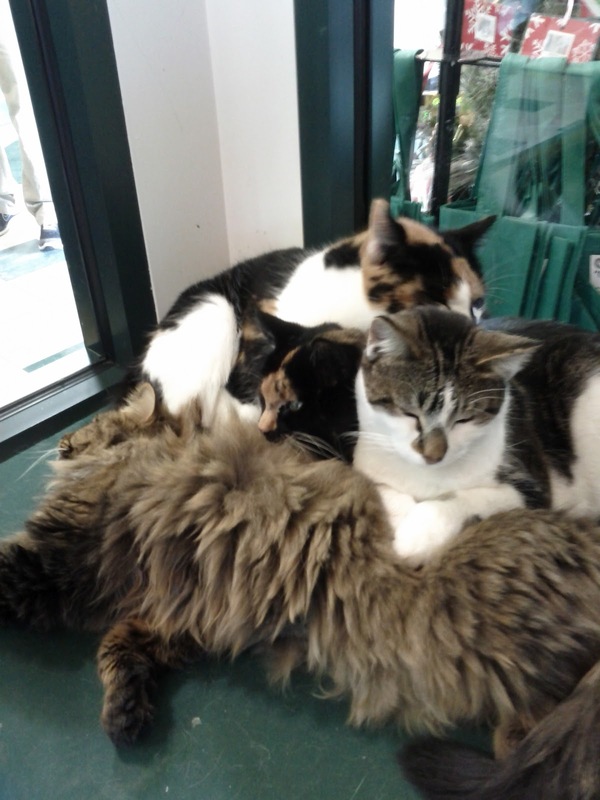 Kitty City sure looks like a good place for forever home waiting! I´m purrying to "Adopt A Shelter Animal" is a wonderful day! My mom person will be there at 9 on Sunday, so you will finally get to meet each other. I'm jealous that I can't come! That looks as good as it gets for kitties waiting for their 4-ever homes. Purrs to all the kitties waiting for their forever home. We hope those rescues and events have a great reception and that lots of kitties find their forever homes. Kitty City II sure looks like a great place for kittehs to wait for their forever homes! We have our paws and fingers crossed that this weekend's event is a huge success. Oh, by the way, we went ahead and added a "subscribe via email" widget on our blog (per your great suggestion). It's in the right hand column, above "Some Blogs We Follow." hiya Cody and Caren...hope the event goes extremely well for the cats. We have an event next weekend called Maddie's Fund which is a great opportunity for peeps to adopt cats and dogs for FREE as well as have Maddie's Fund reimburse the providing shelter up $2K if the animal is a senior with prior medical issues...anyway...it si in the east Bay Area of San Francisco, paws crossed 100's find their furrever homes!! I love the Kitty City premise and hope more of these types of adoption centers will become mainstream. And, of course, every month should be "Adopt a Shelter Cat" month!! I hope lots of kitties find wonderful homes! I absolutely love the Kitty City. Not the forever home every kitty needs, but it's way better than having to wait around in a cage. Wow! That place look so cool!